This book is the same as Voyaging to the Mediterrean Under Power. It is the first title for Mary's book. Soon after publication a claim was made the "Passagemaking Under Power" was trademarked and could not be used. Reseach showed no registered or pending trademark for this title; however, the publisher decided it was not worth the risk to distribute the book and thus required its renaming. The book is not currently in distribution, but Mary has a number of copies she sells at discounted prices of $13 plus $4 postage. Contact her directly. 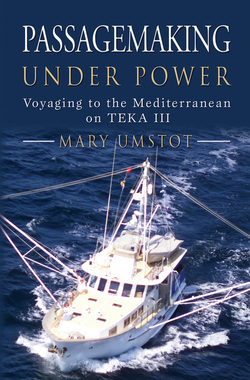 The trademark, "Passagemaking Under Power" is now registered to Mary Umstot and Teka iii as a series of nautical books.